While not as well-known as hot flashes or irregular periods, dizziness is a common symptom of menopause caused by hormonal fluctuations. Many menopausal women report bouts of dizziness and vertigo, which may or may not be associated with other menopause symptoms, such as hot flashes and anxiety. By better understanding dizziness in relation to menopause, women can find the best treatment options for alleviating their symptoms. Learn more about dizziness, its symptoms, its causes, and how to treat it. Dizziness is one of the most common complaints for which American adults seek medical attention. Dizziness is a general term used to describe transient sensations of lightheadedness, imbalance, and disorientation. 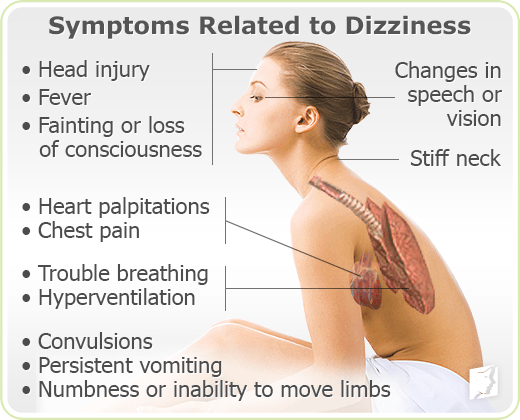 Dizziness can be triggered when a person sits or stands up too quickly, is sick, dehydrated, or is not eating properly. Episodes of dizziness common to menopause are often short-lived, lasting only seconds in duration. Nonetheless, these episodes can be disturbing and sometimes even temporarily debilitating. Vertigo is a false sensation of motion, often described as spinning and whirling. Disequilibrium is a term to describe loss of balance and unsteadiness, causing difficulties walking. Lightheadedness is a general state of floating or wooziness, often after standing up too quickly. Presyncope is a more intense form of lightheadedness when a person feels about to faint. Dizziness from vertigo often happens when one or more of the body's balance control centers are malfunctioning. The following graphic provides an anatomical explanation of how balance is controlled in the body. Episodes of dizziness can be characterized a number of signs and symptoms. 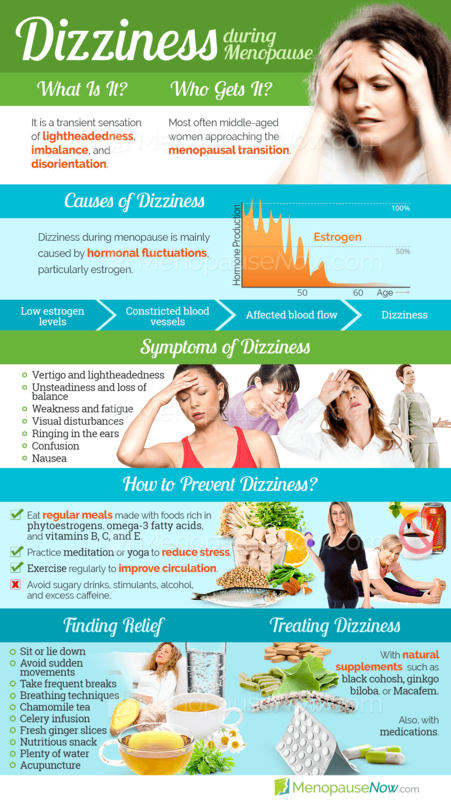 Please keep reading to learn about the symptoms of dizziness during menopause. If it is not attended to thoroughly, or for a long period of time, labyrinthitis caused by bacterial infection can lead to permanent deafness. Because of this, it is particularly recommended that sufferers of this type of the condition see a physician for proper treatment. Constant Dizziness All Day: What to Do? Although feeling dizzy is a common ailment, and affects most women at some point, it is important to acknowledge that it can be a symptom of a serious health matter. If your dizziness occurs in conjunction with vomiting, double-vision, or difficulty using your arms or legs, you should go to the emergency room immediately. Dizziness symptoms can strike at any time of day. While most symptoms of dizziness last seconds, they can make a person feel out of sorts for an extended duration and can sometimes impede on daily functioning. While most people who experience dizziness are familiar with these symptoms, many do not understand the cause of dizziness. Understanding the common causes of dizziness is often the first step in learning how to manage these episodes. Read on to discover more about the causes of dizziness. Vertigo and dizziness are often symptoms of minor afflictions that occur in day-to-day life. However, it is possible that repeated feelings of this sort might be due to something more serious. Many health conditions have dizziness as a side effect, as do many natural or prescribed medications. During menopause, the root cause of dizziness is often hormone fluctuations. Dizziness can also be related to other symptoms of menopause. In rare cases, dizziness during menopause can indicate a more serious condition. While these cases are very rare, it is important to know all of the possible causes of dizziness, outlined below. Changing estrogen levels during menopause can produce changes in the blood vessels and nervous system, which can cause bouts of dizziness. Aside from these varied causes of dizziness, it is important to know that one's sense of balance and equilibrium depends on the proper functioning of at least two of the body's three balance control centers: the eyes, ears, and sensory nerves. If the brain cannot process all of the information from these centers, the messages become contradictory, or if these systems are not working properly, a person can experience dizziness, or a loss of balance or equilibrium. Low blood pressure and other cardiovascular system changes can also lead to dizziness. Continue reading to learn more about when the causes of dizziness may warrant a visit to the doctor. Dizziness is one of the lesser known symptoms of menopause, but it still affects a large number of women. Dizziness can be caused by decreasing levels of estrogen in the body, so dizzy spells may seem like they have no obvious trigger. Click here to learn more about dizziness during menopause. While most menopausal women who experience dizziness do not require medical attention, it is important to understand when a visit to the doctor may be necessary. If dizziness is accompanied by any of the symptoms to the right, a woman should contact her healthcare professional as soon as possible. If hearing or ear problems occur with dizziness, it may be wise to speak with a doctor to rule out or treat ear disorders, such as Meniere's disease. Read on to learn more about how dizziness can be treated. Sometimes, dizziness can be a side effect of a cold or flu. When you become congested, it can lead to a pressure in your head, which is sometimes described as "brain fog". Other factors that can cause severe dizziness include certain menopause symptoms and inner ear infections. Treatment of dizziness often depends on the underlying cause. Because the most common cause of dizziness during menopause is hormonal fluctuations, treating this root cause often provides relief. It is generally recommended that patients begin with the least invasive approach to dizziness treatment. Lifestyle changes and self-care are often the first steps in treating dizziness associated with menopause. Eating healthy, drinking enough fluids, and exercising regularly can help to reduce episodes of dizziness. Women who become dizzy when they stand up should take precautions to avoid getting up too quickly or making sudden changes in posture. While these lifestyle changes can help, they are unable to treat the root cause of dizziness in menopause: hormonal changes. Fortunately, approaches in alternative medicine are available to treat the hormonal causes of dizziness during menopause. Often, the best approach to treating dizziness during menopause is one that combines alternative medicine with lifestyle changes. Most experts recommend that women who suffer from dizziness and wish to treat it begin with lifestyle changes, then move onto alternative medicine, and finally, look to medications if nothing else seems to work. Click on the following link to learn specific treatments for dizziness in these three categories. Menopausal dizziness can be bothersome symptom during menopause, but it typically does not last long (i,e; only exteme causes). In addition to these beneficial herbal remedies, it is recommended to maintain an active lifestyle and healthy diet in order to prevent menopausal dizziness during menopause. Dizzy spells are a common symptom of menopause, and they are generally caused by hormonal imbalances. However, there is a handful of other, less common causes of chronic dizziness. Talk to your doctor about the possibility that allergic reactions, anemia, diabetes, aural disorders, or tumors could be causing your dizziness symptoms. Ogun, O.A. et al. (2014). Menopause and benign paroxysmal positional vertigo. Menopause, 21(8), 886-889. doi: 10.1097/GME.0000000000000190. 11/19/2018 As the most common causes of vertigo, not much is known about benign paroxysmal positional vertigo (BPPV), the condition that causes you to feel a false sense of spinning or moving. Discover answers to your common questions about positional vertigo here. Are Dizziness and Daily Headaches Normal during Menopause? 12/21/2016 Going through menopause often means putting up with various uncomfortable symptoms, and some people wonder if dizziness and headaches are a normal part of the package. This article talks about the two symptoms, what causes them, and whether you can expect them in your menopause transition. 07/06/2016 Dizziness and migraines often go hand in hand. Common causes of migraines and dizziness include dehydration, hormone fluctuations, and skipping meals. It is crucial to maintain a healthy and active lifestyle, drink plenty of water, and get sufficient amounts of sleep to prevent dizziness and migraines. 06/23/2016 If you suffer from dizziness during your period, you will understand the discomfort it can cause. Dizziness during the menstrual period is a symptom felt by many women, and it can occur for a number of reasons. This article explains more about the reasons behind dizziness and how the menstrual period can contribute.